Most people suffer back or neck pain at some time in their lives. Understanding how the spinal structures are arranged and function is important for preventing or dealing with problems. The spinal column extends from the base of the skull to the pelvis, forming three groups: the neck or cervical spine, the upper back or thoracic spine, and the lower back or lumbar spine. It supports the head, shoulder girdle and rib cage, and ends at the sacrum, whose lowest tip is the coccyx or tail-bone. The sacrum is the back of the pelvic basin, the sides of which are formed by the two hip-bones, which meet at the front as the pubis. The spinal bones are called vertebrae. The majority are cylindrical blocks of bone arranged one above the other, separated by shock-absorbing discs. The cylindrical blocks are called vertebral bodies, and they form the most solid part of the spinal structure. Behind the vertebral body is a roughly triangular arrangement of finer bones, called vertebral arches, which have small struts protruding from either side (transverse processes) and from the back at the apex of the “triangle” (spinous processes). The spinous processes are the knobbly bones that can be seen and felt in the centre of the back. They stand out most when you bend forwards. Two vertebrae are different from the rest: the atlas, which supports the skull (cranium), and the axis directly under it. The atlas is formed as a ring, without a body or spinous process. The axis has a small body and a spinous process, but is unique in having a knob of bone at the front which locks into a recess in the atlas above. There is no disc between the head, the atlas and the axis. The vertebral bodies are simply arranged, one on top of the other, separated from each other by the intervertebral discs, except between the uppermost two. Each disc has a fluid-filled central part, the nucleus pulposus, surrounded by the annulus fibrosus, which is composed of fibrocartilage and collagen to form a strong binding ring around the nucleus. The discs in the lower back are the thickest, while those in the neck are much thinner. The discs account for about one fifth of the length of the spine in a healthy young adult. The joints between the vertebral bodies are cartilaginous, as they don’t have synovial sheaths or lubricating synovial fluid. The vertebral bodies are bound together at the front by a strong ligament, the anterior longitudinal ligament, which runs more or less vertically from the base of the skull to the front of the sacrum. The posterior longitudinal ligament binds the backs of the vertebral bodies from the second cervical vertebra downwards. There are no ligaments at the sides of the vertebral bodies. The fine struts of bones at the back of the vertebral bodies interlink with those above and below at each level to form a complicated arrangement of fluid-filled (synovial) joints. The spinous processes are linked by the supraspinous ligament from the seventh cervical vertebra downwards, and the base of the skull links to the cervical spinous processes through the ligamentum nuchae. The spinal cord lies within the space called the vertebral foramen created by the triangle of bones at the back of the vertebral bodies. Fine nerves run off sideways from the central cord through gaps between the bones called the intervertebral foramina, to supply all areas of the body. The spinal cord and the brain form the central nervous system, while the nerves which spread out from the cord form the peripheral nervous system. Most people have seven cervical vertebrae, twelve thoracic and five lumbar, although there can be variations in individuals. Seen from the side, the vertebrae are arranged in curves. The neck curves inwards forming a lordosis, the upper back outwards in a kyphosis and the lumbar spine inwards (lordosis). Seen from behind, the spinal bones should theoretically form a straight vertical line, but in practice many people have a sideways twist or curve, called a scoliosis. The muscles controlling the trunk are arranged in complicated layers over the front, back and sides of the body. The front consists of the throat, chest (including the rib-cage) and abdominal regions (including the pelvic bones which link to the hips). There are large muscles controlling the main areas, such as the pectorals across the chest and several layers of abdominal muscles, and there are numerous smaller muscles. The deep abdominal muscles normally consist of the internal obliques and the transversus abdominis muscles, although some people don’t have the transversus. The largest muscle covering the back is latissimus dorsi, which spreads from the top of each hip-bone to a point on the front of each shoulder. The back is covered with muscles, some extensive and long, some short and tiny. These muscles create movements in the spine and trunk as a whole and between individual spinal joints. 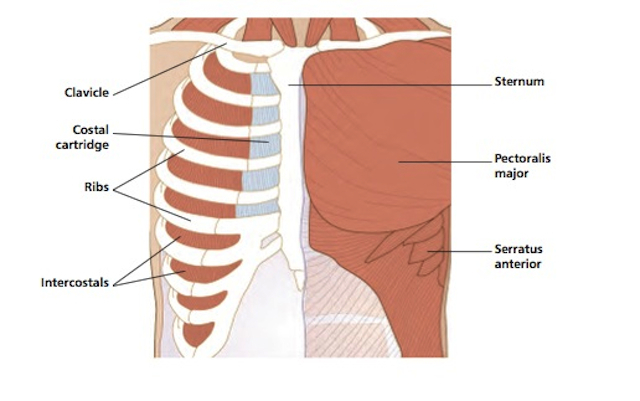 There are muscles which connect the rib cage to the thoracic spine, and others, such as trapezius and the rhomboids, which link the thoracic spine and neck to the shoulder girdle. 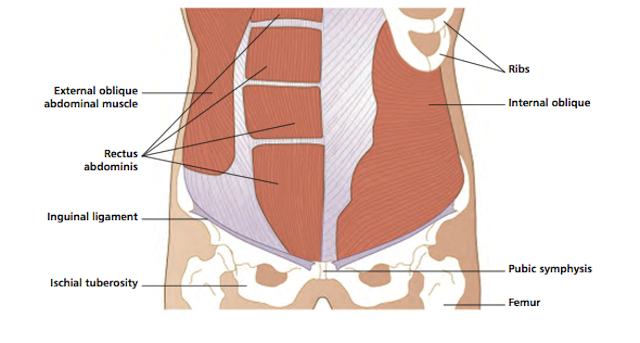 Muscles which are angled sideways control the sides of the trunk, including the oblique abdominals at the front, and serratus anterior round the sides from behind. The trunk can bend forwards, backwards and sideways, and twist. Basically, the muscles in front of the spine, mainly the abdominals and hip flexors, bend it forwards against gravity, into flexion; the extensor muscles bend it backwards into extension; the muscles on one side of the spine create side-bending (lateral flexion); and rotator muscles create the twisting movements. When we are upright, the effect of gravity influences how our muscles work. The line of gravity passes (approximately) down through the top of the head, between the ears, in front of the 6th thoracic vertebra, through the 11th or 12th thoracic vertebra, slightly behind the hip joints, slightly to the front of the knee joints, and down to the ground between the feet, just in front of the level of the ankles. The body’s centre of gravity is said to lie just in front of the second sacral segment. Of course there are individual variations to this description. In the upright position, there are always small muscular adjustments going on, according to our posture and our particular structure. Standing up. forward bending is controlled by the back extensors, and the abdominals play little part in the movement apart from initiating it. Similarly, the abdominal muscles control backward bending or extension, while the side-trunk muscles on the opposite side to the movement control sideways bending. The lumbar spine is relatively stable, because the blocks of bone are quite big and firmly interlinked, and the lumbar discs are the biggest. In particular, there is very little rotation movement in the low back. Most of the trunk’s twisting movement happens in the thoracic spine, whereas side bending in this region is restricted by the rib cage. The neck (cervical spine) has the greatest freedom of movement. The joint between the axis and atlas allows the head to swivel from side to side in a wide arc. The back and neck are constructed to perform many functions, and to withstand a lot of pressure. However, these versatile structures are also vulnerable to damage from overuse, misuse, accidents and disease. In early childhood, the back is at its most pliable and least vulnerable. During the teenage years through to the early twenties, when the structures are developing into their mature forms, the spine becomes more vulnerable to certain types of damage, especially through repetitive stresses. With ageing, degenerative changes can happen in the spinal joints and linking structures, combined with decreasing strength and pliability in the controlling muscles. The intervertebral discs tend to shrink and become less elastic, losing some of their shock-absorbing capacity. We can increase the risk of problems through carelessness in everyday life. The force of gravity contributes to our tendency to hunch the body. The back extensors are our antigravity muscles. if they are weak, we tend to be weighed down forwards into the bent (flexed) position. In normal life, we can spend a lot of time hunched up - think of how slumped you can be when you relax on a couch, sit in an easy chair, or sit at a desk reading or working at a computer for long periods. Many people stand and walk with their head down. Trauma can cause severe damage to any part of the trunk. The neck has little protection if it is subjected to sudden adverse pressures, as in a whiplash injury in a car crash, or the fracture caused by a collapsing scrum in rugby. Even though the lower vertebrae are stronger than those of the neck, they can also be fractured or crushed by a heavy fall or blow. 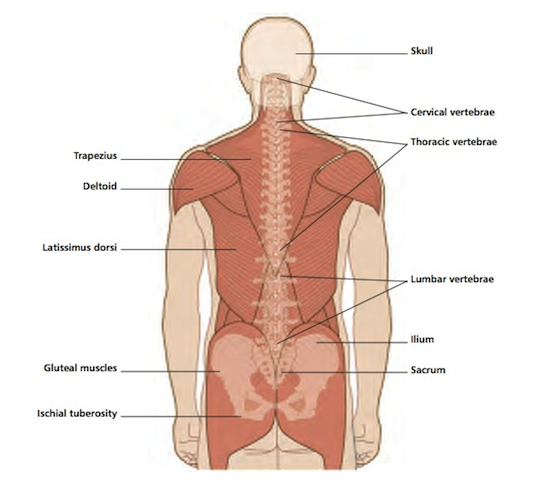 The spinal structures, especially the discs. are vulnerable to damage through lifting weights, and through coughing or sneezing with the back bent. Pressures on the spinal structures are significantly reduced when the back is held straight. Lifting a weight up awkwardly is dangerous enough, but putting it down carelessly is even more risky, as the muscle work is more complicated on the downward movement. Over-stretching can also cause damage. It’s difficult to stretch the back muscles safely, because of the mixture of short and long muscles: you don’t feel when the elastic limit of the shortest muscles is reached or exceeded, as the longer muscles, which are more elastic, are the ones you are aware of. The spinal joints can also be disrupted by repetitive stresses, such as the vibrational forces from a pneumatic drill, or the rotational pressures from sports like rowing or fencing, which involve a lot of one-sided twisting movements. Imbalance is a primary cause of problems involving the vertebral column. This can be imbalance between the front and back of the trunk, between the sides, or imbalance between the upper and lower parts of the body. Running and cycling create leg strength, but do not provide training exercise for the arms. Canoeing requires upper body strength and power, but does not work the legs. Most sports involve using the front of the body more than the back, so they tend to draw the body into the flexed position. This is especially marked in competitive weightlifters and powerlifters. The exceptions include backstroke swimming, doing backward somersaults in diving or gymnastics, and martial arts like tae kwon do. Dehydration can also be a factor in back pain. Muscle spasm or cramping is usually part of any back problem, and this is made worse if one’s water intake is inadequate. Problems with the kidneys, especially kidney stones, can cause back pain. Drinking enough water is a major part of keeping the kidneys healthy. The back and neck are prone to pain when the body’s immune system is depressed or depleted. There are many conditions, such as ankylosing spondylitis, which cause pain in the lower back or trunk. There are viruses which attack the spinal nerves, causing pain. Illnesses such as glandular fever and meningitis are often accompanied by acute neck pain. Common infections such as ‘flu can bring on neck or back pain. A common mistake is to think that a sudden neck pain on waking has been caused by sleeping awkwardly or being in a draught, whereas most often it is the first sign of an infection, and the symptoms of the illness follow some days later. Any of the structures in the back and neck can be damaged by adverse stresses. 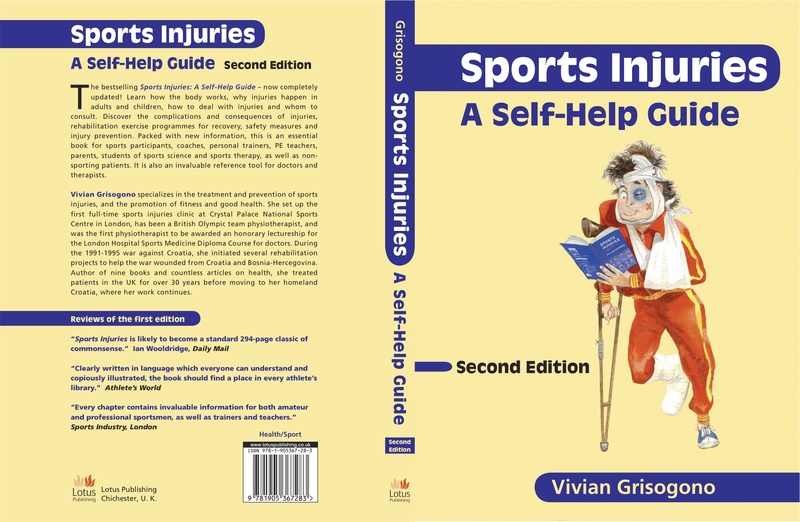 The bones can be broken or cracked through trauma, such as a bad fall, or through attrition, for instance because of repetitive rotational movements in rowing, fencing or tennis. The ligaments linking the spinal joints can be torn or strained, while the intervertebral discs can be crushed or ruptured. In a major accident the spinal cord can be broken, causing loss of feeling and movement which may be temporary or longer lasting. Pressure on the peripheral nerves where they lie close to the vertebrae causing referred pain or symptoms of tingling or numbness in the pathway of the affected nerves in the arm(s) or leg(s). Sciatica is pain related to pressure on the sciatic nerve, which passes down the back of the leg. Referred pain is often, but not always caused by disc damage. When there is pain in the back or neck, there is usually also muscle spasm, a kind of cramp-like tightness. It’s a reaction to tissue damage, but muscle spasm can also be a cause of pain in itself. When pain is caused by illness or infection, there is always muscle spasm, but usually little actual tissue damage even when the pain is very severe. When the trunk is weak, posture is compromised, and it’s difficult to sit or stand up straight. Lack of stability makes it harder to use our limbs efficiently and fluently. Muscle weakness or stiffness are part and parcel of back pain. Correct posture is vital. Sitting in awkward or slumped positions for any length of time sets the back and neck up for problems. Any asymmetrical posture creates torsional stresses and imbalance in the spinal joints, whether lying in bed reading, standing with one’s weight balanced over one leg, sitting with the legs crossed, or watching television at an awkward angle. Sitting and standing rigidly straight is not the answer. We should aim at symmetrical posture, combined with gentle movements, to avoid being static and getting stiff. To achieve good posture, we need balance between the major muscle groups supporting the trunk. Anyone whose activities or sports create imbalance should do exercises to redress it as protective conditioning training. So runners need to work on their upper body, shoulders and arms, canoeists should strengthen their legs, while tennis players, fencers and athletes in the throwing sports should work on their weaker side. We need good efficient function in the trunk area, as it is the central part of our body, housing the vital organs and acting as a base for our arm and leg movements. Efficient deep abdominal muscle activity is often referred to as core stability. It’s the basis for good balance around the trunk and protection for the back. When the deep abdominals are activated, the abdomen is pulled inwards, making the whole area between the rib cage and the pelvis look hollow. The deep abdominals should work in co-ordination with the more superficial abdominals, the chest muscles and the back muscles. It is the balance between all these muscles which gives good posture without strain, protects against back pain, and has to be recovered after back problems. Proper function in the chest area helps reduce pressure on the abdominal region and its organs. The back extensor muscles need to be strong to balance the trunk and to hold us upright against the effect of gravity. 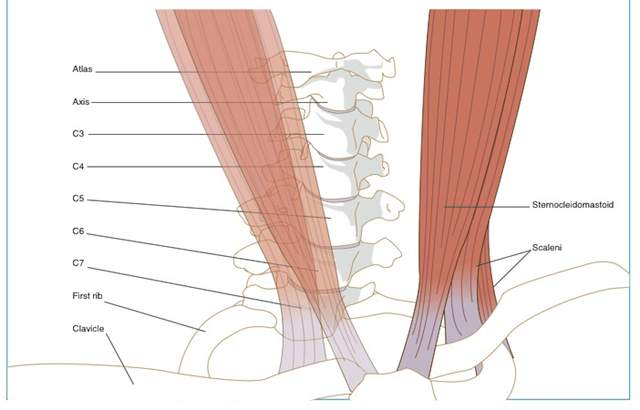 In normal life the back extensors are rarely exercised against gravity, so they often lack stabilizing strength. Breath control is essential for good heart-lung co-ordination and an efficient oxygen supply to our working muscles. It can also help to reduce tension. Deep breathing can reduce body acidity. The action of deep breathing keeps the joints of the rib-cage free. The working muscles include all the muscles round the rib-cage, including the intercostal muscles between the ribs, and the diaphragm, a large sheet of muscle which separates the upper trunk (chest and upper back) from the lower part (abdomen and lower back). Breath control is an important part of lifting heavy weights. The back should be kept straight, head up, so you squat down to use the legs as the driving force for the lift. The weight should be kept close to the body. Breathe in as you prepare for the effort, breathing out as you lift the weight upwards. The same principles apply when bringing a load down from a height.